"Sampath Speaking" - the thoughts of an Insurer from Thiruvallikkeni: Kevin Pietersen dropped .... team meeting - feedback and opinion giver. Kevin Pietersen dropped .... team meeting - feedback and opinion giver. Kevin Peter Pietersen, was born in Pietermaritzburg, Natal Province, South Africa. He made his first-class debut for Natal in 1997 before moving to England, after voicing his displeasure at the racial quota system in place in South Africa. His English mother made him eligible to play for England and after serving a qualifying period of four years playing at county level, he was called up almost immediately into the national side. He made his international debut in the One Day International match against Zimbabwe in 2004 ~ scored 8181 test runs in 104 tests with 23 centuries and 444o one day runs in 136 matches. ~ the interesting character has almost played his last International innings and might have to concentrate in IPL !!! This one from King Cricket is most readable : In our experience, the employees most likely to be considered ‘team players’ are the obedient, unquestioning ones. Management may make great show of inviting feedback – and they may honestly believe that they’re open to it – but the truth is that no-one makes a decision thinking it is the wrong one. Most of us, when our thinking is questioned, are liable to grow defensive. We’re also likely to somewhat take against the person who is challenging us. A manager might think: “Why are you trying to undermine me? Why can’t you be more of a team player, like Alan or Deano?” ………….this sort of situation is compounded when the questioner reads social situations badly and when the person being criticised is feeling vulnerable anyway. 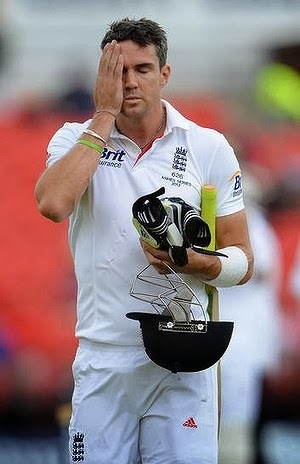 We wonder to what extent this might be what happened with Kevin Pietersen, Alastair Cook and Andy Flower in Australia. King Cricket adds : Andy Flower is a strong man. Few would question that. Could a man who took a stand against Robert Mugabe ever feel threatened by someone like Kevin Pietersen? Well, perhaps. Taking a stand against a dictator takes courage, but if anything it is an act which adds to your sense of self. It’s the flipside of having conviction. When things are going badly, conviction might manifest itself as greater certainty that you are right and a belief that what is going wrong is that people aren’t doing exactly what you want them to do. They are not alone …. More British Press including Telegraph puts it that KP’s anti-Andy Flower rant was the final nail in his England career… it is stated that the strong batsman misjudged the mood of a team meeting and heavily criticised the coach who later intervened during a disagreement with the captain over practice ~ the crisis meeting of England squad in Melbourne set in motion a train of events which culminated in a showdown with Andy Flower that sealed his fate as an international cricketer. It is reported that Alastair Cook and Matt Prior, the captain and vice-captain, called an emergency meeting of the players on Dec 30, which should have been the fifth day of the fourth Test, without the knowledge of the coaching staff. It was agreed that a schoolmaster-pupil relationship had developed in which players were relying too heavily on Flower to provide direction rather than standing on their own feet. Flower got to hear about it and demanded an explanation. He spoke to Pietersen in his hotel room in Sydney, which is when the whole situation, and simmering tension on a losing tour, blew up. Flower then asked other players present at the meeting if it was true that they felt his coaching methods were the problem and was told that was not the case. Later when Downton met Flower for his tour debrief this row helped to harden attitudes against Pietersen. That move since led to a national debate with radio phone-ins on the BBC devoted to the handling of one cricketer. It also turned nasty as Prior was drawn into a row on Twitter with Piers Morgan, Pietersen’s loudest public ally, over the events in Melbourne. Pietersen’s wife too took to social media to attack her husband’s critics. She described Dominic Cork, the former England player turned broadcaster, as a liar for suggesting her husband and Cook nearly came to blows in Sydney. So, it appears more that KP was eventually sacked because he disagreed with aspects of Alastair Cook's captaincy ~ at a time when Cook himself deserves to be demoted. Pietersen is still capable of scoring Test centuries, and seemingly he has been dropped for reasons other than cricket ability. Theoretically in meetings be it Players or any other member of any team – those who question the way things are done actually help the decision maker. Those calling for feedback can learn from the way others think, and secondly, the argumentative ones could also be the ones who would not cry defeat and work positively for correcting the situation……. England is not alone, it may not happen in India – no player might have the guts to question the Captain or the powerful Board … nowadays, players are outnumbered by the support staff, who all have a say in team affairs. Remember when India won the Prudential World Cup in 1983, PR Mansingh was the only official – the Manager who took care of the nets, travelling, ticketing, hotel booking and everything else. Now there is a big Support team of Head Coach, Mental conditioning coach, Fitness trainer, Physiotherapist, Masseur, Performance analyst, Bowling consultant and more ~ and would anyone take the blame for these consistent defeats abroad… !!! ~ every major loss – there would sure be scapegoats.